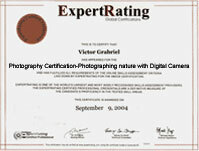 (leading to Photography Certification-Photographing nature with Digital Camera). Nature photography can be a fun, relaxing, and exciting hobby! In this Photography course, you'll learn about the many aspects of outdoor photography as well as how to master your digital camera's controls and features. With the knowledge you gain in this photography course, you'll be taking exceptional nature photos in no time. In addition, the Photography Course describes macro photos, which are extreme close-ups of small items in nature. You'll find macro photography opens up a whole new world for you! And then we'll discuss using your computer to process your photos and digitally correct the most common problems. We'll wrap up by exploring abstract nature photography. You'll see how your photos can become works of art rather than just snapshots of nature. By the end of this course, you'll have become the nature photographer you always wanted to be! This course includes a knowledgeable and caring instructor who will guide you through your Photography lessons, facilitate discussions, and answer your questions. The instructor for this course will be Curt Simmons. About the ExpertRating Online Photography Course (Photographing nature with Digital Camera) instructor : Curt Simmons, M.Ed, MCSE, MCSA, CTT, is a best-selling author, technical trainer, and multi-media expert. Curt has written over forty computing and technology books on a variety of topics, including How To Do Everything with Windows XP, Mac OS X Headaches, iPhoto For Dummies, and How To Do Everything with Photoshop Album. Curt's multi-media expertise provides a focus on digital photography and other Internet related technologies. He is both a classroom and online instructor, and has developed custom courseware for major U.S. companies. Online Photography Course requirements: For taking this instructor led ExpertRating Online Photography Course (Photographing nature with Digital Camera) you need Internet access, e-mail, the Microsoft Internet Explorer or Mozilla Firefox Web browser, and the Adobe Flash and PDF plug-ins (two free and simple downloads you obtain at http://www.adobe.com/downloads by clicking Get Adobe Flash Player and Get Adobe Reader). "I enjoyed this Photography course. I have learned Photography techniques that have improved how I look at pictures. Thanks!" "I liked the way students could share their opinions and their work with others in the class. It gave us the opportunity to view different approaches of photographing nature"
"Thank You....Thank You.........Thank You!!!! This course opened up a whole new world for me!" "Thank you, tons of new Photography stuff for me." "This course exceeded my expectations. I'm really glad he covered Photographing Nature with digital canera. I have been wanting to learn to use that program. I purchased a copy during this course and really enjoy using the program. I like Curt Simmon's style--it was a perfect course for me." ExpertRating is one of the world's only ISO 9001:2015 Certified companies (from TUV America) offering an Online Photography (Photographing nature with Digital Camera) Course (leading to ExpertRating Photography (Photographing nature with Digital Camera) Skills Certification). When you choose the ExpertRating Online Photography Course (Photographing nature with Digital Camera) you can be sure that you are buying a premium International certification that is recognized by hundreds of employers and Government bodies in the US and other countries. With ExpertRating you get certified quickly online and you are equipped with a store house of information through the in-depth ExpertRating Online Photography Course (Photographing nature with Digital Camera) Courseware which has been developed by experienced Photography Experts. The ExpertRating Photography Training Certification is by far the best value for money instructor led Photography Program at $129.99. How much does the Photography Training Certification cost and what does it include? You can buy this ExpertRating Online Photography Course (Photographing nature with Digital Camera) leading to Photography certification at a special offer price of only $129.99 which includes the in-depth ExpertRating Online Photography Course (Photographing nature with Digital Camera) Courseware and exam fee. This is the best value for money Photography Program available till date. You get the following services within the USD $129.99 fee. In-depth ExpertRating Online Photography Course (Photographing nature with Digital Camera) Courseware including scenarios and case studies. The process of getting yourself certified is very simple. All you have to do is buy the ExpertRating Online Photography Course (Photographing nature with Digital Camera) for $129.99. Log in to the instructor led course using your password. Go through the ExpertRating Online Photography Course (Photographing nature with Digital Camera) Courseware (which would take you 6 weeks) and complete the final Photography Certification exam at your convenience. You can complete the exam within 2 months of buying the Photography Certification. The result of the exam appears as soon as it is completed, and your Photography Certificate is mailed immediately. What is the final Photography exam like? The final Photography exam is fully based upon the; ExpertRating Online Photography Course (Photographing nature with Digital Camera) Courseware that is provided along with the Photography Certification. If you have gone through the courseware properly you should not have a problem clearing the exam. The exam consists of multiple choice questions from all chapters of the ExpertRating Online Photography Course (Photographing nature with Digital Camera) Courseware. A professional photographer can get job opportunities in advertising agencies, newspapers, fashion and design houses, news channels, industrial houses, government departments and magazines. This course is a blessing for budding photographers and even professionals who intend to take efficient and high quality photographs of nature. The ExpertRating Digital Photography course will help you excel in the art of digital photography. However, it is also important to remember the old adage, “Practice makes a man perfect”. The first lesson explores what makes nature photography an exciting and joyful hobby. You'll do fun exercises that help you focus on the details in the world around you. We'll delve into the concepts of composition, form, shape, and contrast. And finally, you'll join me on a photographer's journey in one of my favorite places in the world! Nothing could be more important to a photographer than light, right? Explore how to work with different kinds of sunlight, use fill flash, and photograph the sun. We'll talk about using the rule of thirds to compose attractive photos, and we'll also take a look at three cool natural forms that make great patterns to photograph. Light + composition + natural forms = the next step in your development as a nature photographer! Landscapes are a pleasure to photograph, so we'll explore how to make landscape photos that are a pleasure to look at, too! In this lesson, you'll figure out how to manage aperture settings and depth of field to get the most from your landscapes, and you'll realize the benefits of focal points and vantage points. You'll also receive some tips to help you spice up landscapes that are flat or lack obvious details. Nature is full of interesting subjects to photograph, and flowers and trees are two of the best. So get ready to experiment photographically with a variety of textures, patterns, and colors. Learn the basics of photographing flowers, and then we'll move on to explore advanced techniques the pros use. You'll also gain an appreciation for the ways trees can communicate feeling and practice photographing them in a way that evokes the specific feeling of a season or place. You'll discover the joys of trying unexpected perspectives as you take your photos. Water is a fun subject to photograph, but it does present some challenges that we'll tackle together in this lesson. You'll learn how to use your camera to compose photographs of large bodies of water (like oceans and lakes), and you'll receive fun tips for taking effective shots of streams and rivers. You'll also get better acquainted with your shutter-speed settings and practice controlling them to blur or freeze action to create interesting effects. Telephoto equipment can help you get close to subjects that are far away or too dangerous to approach, thus giving you access to an otherwise inaccessible natural world. Investigate the ways telephoto equipment can enhance your experience of nature photography. You'll find out how your camera and lenses handle magnification, and you'll gain an understanding of how to work effectively with a telephoto lens. Then we'll turn our attention to composing telephoto shots, and you'll practice photographing clouds, the moon, and the stars. Whether you're already working with a telephoto lens, want to buy one, or prefer to stick with the zoom lens on your consumer camera, this lesson will help you gain confidence in the telephoto realm. Large animal photography, as you might expect, can be a lot of fun and very exciting! In this lesson, we'll explore how to get the best photographs of large animals, whether domesticated or in the wild. You'll photograph single animals, groups, and animals in zoos and other captive areas. You'll also learn how to get pets to cooperate for a photo shoot! Delve into strategies for photographing small animals in the wild, including reptiles and other sneaky creatures. We'll discuss common composition, angle, and lighting issues you're going to be wrestling with. You'll learn tricks for photographing small animals at zoos, including animals in terrariums and aquariums. And you'll receive tips for photographing your small pet, including how to keep your pet's attention and what to do to avoid getting an ugly yellow color cast in your photos when shooting pet portraits indoors. In this lesson, you'll learn about the challenges of photographing birds and the techniques for overcoming those challenges. Birds in flight, for example, can be tough to handle, because you have to be fast on the draw with your camera's settings and manage backlighting to prevent exposure problems. You'll learn to deal with these issues and get started setting up a bird photo studio in your own backyard, which you can use to practice all of your bird photography skills year-round. Delve into macro photography, which you'll use to document some of the smallest creatures in our natural world. We'll sort through your equipment options, ranging from inexpensive attachments to more expensive options like macro lenses. And we'll investigate the particular challenges of exposure, shutter speed, and depth of field. We'll end with a look at a collection of macro photos and discuss what works and what doesn't. Photo-editing software gives you the opportunity to correct common photography problems and enhance photos creatively. Need to fix a blemish, crop a photo, or adjust the color? In this lesson, you'll find out how to make these quick fixes. Then we'll turn our attention to more advanced functions, like using layers and masks to make complex edits. And we'll finish by exploring some of the just-for-fun options of photo-editing software, like special-effects filters and using layers to add text. If you're not already working with photo-editing software, I'll direct you to a free program you can download in order to explore the techniques we discuss. This lesson wraps things up with a fun exploration of the creative possibilities of abstract nature photos. You'll expand your understanding of subjects and composition, and you'll see how abstract photos work to achieve a specific effect or feeling. We'll end our discussion with a tour through a gallery of abstract photos, and I'll share a final entry in my photo journal about my visit to Tulum, Mexico—a favorite spot for photographers.